I get to the prison at 8:10am for my Saturday visit. I enter the building. There are two female officers in the control room. They take no notice of me. There are supposed to be officers at the check-in table at 8:15. They show up at 8:30. While I am waiting, a young woman walks in, she is smiley and bubbly. She tells me that she goes to a state college and tries to visit her friend once a month. It is a four-hour drive from where she lives. She comes up here so often that the lady at the gas station knows her and always gives her change. The reason for the change is that you can only bring one and five dollar bills into the visiting area for the vending machines. Sometimes the change machine doesn’t work, so it’s best to bring ones. She continues telling me that she usually wears flip-flops and the guards always tease her. It is cold today so she is wearing uncomfortable boots because that was all she had in her car. It reminds me of the time that a small Asian woman was dropped off and the guards wouldn’t let her in because she was wearing shorts. Luckily, I had my suitcase in my car and I gave her a pair of jeans. She wore my jeans over her shorts so that she could visit her friend. It’s always up to the guards whether they let you in or not. The rules are there, however they can be interpreted differently by each guard. I check in and am the first person in the waiting room. The loud clank of the doors closing does not bother me anymore. I do not cry while I am waiting anymore. Although I am not religious, I do say a prayer for strength before my brother gets there. On busy days, the vending machines empty quickly. So I survey all of the machines and make my selections. I haven’t been here in 9 months you might want to mention that you live far away and that’s why you have not visited for so long and I notice that all of the machines are new and they have fruit and water now. I am pleased with the new selections. I first select Munchos, because that’s what we always start with. I notice a new machine with coffee and hot chocolate. I purchase a very welcome hot chocolate while I am waiting. During previous visits I had to check-out a deck of cards. Now there is a table with toys for children and cards so I can select a deck. I drink my hot chocolate and play solitaire while I anxiously wait for the arrival of my brother. Even though I was the first visitor to arrive, my brother is the second inmate to be brought in. The friend of the girl that I had been talking to arrives first. I notice that the girl gives him a big kiss and hug when he arrives. I wonder if she wants to be more than friends and that is why she visits so often. I become aware of many personal stories in the visiting room, so this one is not uncommon. I haven’t figured out if it’s the man taking advantage of the woman or vice-versa. But truly, it is none of my business. When I see my brother, I walk to him and give him a big hug. I make the extra effort of going to him, instead of waiting for him to come to me, because I want him to know that I am glad to see him. I select chairs on the far end of the room, away from the guards. We always try to get as far away from the guards as possible so that we can talk in private. During the first four hours of our visit we play cards and talk. We catch up on people’s lives, what I’ve been doing, and what he’s been doing. He always says that things are the same for him, but once he starts talking he does have a lot to say. He works in the law library and helps a lot of people. He is a short man, so I believe that he gets by on his brains. 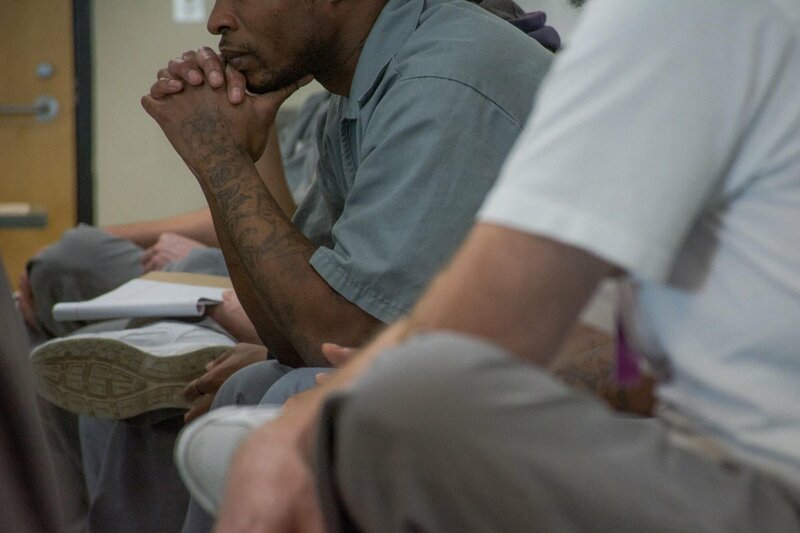 It’s a tough place to be and I’m sure that the inmates that I see in the visiting room with their friends and families carry a different persona on the inside. I am now used to the children running around and the couples holding hands and families sitting together and telling stories and laughing. It does not seem weird to me anymore. We all smile at each other knowing that we are all in the same boat. I am also used to all the different types of people there. Some of these people I wouldn’t have given the time of day to in previous years. If there is a lesson here, it is that we are truly all the same. Some may make more money, some may wear nicer clothes, some may have closer family ties, but none of that matters here. We all have a loved one in prison that we are visiting and we try to make the best of our time. Nothing else matters here. There are no televisions, radios, or cell phones. There are no distractions. It is a time to make the best of your time, the only time, that you have to spend with your loved one. My brother purchased picture tickets in advance. He does this every time I visit. The photographer arrives with the Polaroid camera and takes 2 pictures: one for my brother and one for me. We view the pictures when they are developed. They came out good. I could put my arm around him, but he had to stand straight up with his hands in front of him. He looks kind of rigid, but I think it’s a great picture of us. I probably won’t put it up in my house because he is in his prison uniform, but I will put it in a special place where I can see it. We have to place the pictures on the guards’ desk so that we can retrieve them when we leave. After the first four hours he gets down to business and tells me what he knows I don’t want to hear. He tells me how miserable and unhappy he is. He tells me that no matter how much he tries, he can never be right, that the guards yell at him no matter what he does, that the inmates yell all the time, that this place is intolerable. He says that he can’t take it any longer and doesn’t know how long he is going to last in here. He talks about the kids in there and how they come in for a year or two and think it is a game. He tells me about one 21 year old who actually said it was fun. In all my brother’s wisdom he knows that this young man will be back again and it will not be fun. I try to offer advice on how to make the best of it. I talk about finding his purpose in life no matter where he is. I remind him about all of the people that he helps in the law library. I know this doesn’t offer a lot of condolence to him, but it is the best I can do. He doesn’t tell me how horrible it is on the inside, but I have spoken to others and read a lot of stories written by inmates. I cannot imagine what life is like, but I try to keep a positive attitude. It is not difficult leaving on a Saturday because I know that I will see him again tomorrow. It is Sunday that I dread, when I know that I will not see him again until our next visit. He told me that it is like a high knowing that he is going to get a visit. But the downfall after I leave is terrible. We discuss me coming to visit more frequently if I lived closer, but he said that it wouldn’t make a difference. That he would just be more depressed every time I left. In addition, there’s no assurance that he will stay at this facility anyway. They can move him whenever they want without telling a family member. So we decide that I would try to visit him twice a year. When I was visiting just once a year, he said that was too much time to wait in between visits. It makes it more bearable if I can visit twice a year. So this is what I will try to do. Does he get other visitors? You might want to mention that you are one of his only visitors if that’s true. I collect the picture that we have taken this day and he collects his. He goes back to his cell and I go back to my hotel to write, to try to understand this life, to try to help and prepare others for what their life is going to be like. It has been six years, but I am ready to share what I have learned. Hopefully this information will help you, too. Hopefully you have read this before you even went to court. If not, I hope that you read this before your first visit. The first visit is a test of strength, character, and knowing who you are. Thanks again for sharing your experience. It’s great that you’re writing so in-depth, and recalling all the small details. It’s the small things that you often don’t think about, and sometimes they can be the hardest to understand or deal with. How true. My hopes is that by sharing it will help others prepare for their visits. Appreciate your comments. Feel free to share. You never know what bit of information will help someone else.